Beach Huts in Bang Bao. 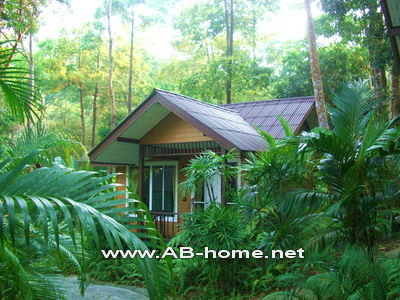 Remark Puzi Hut is a bungalow resort with simple and cheap rooms in Bang Bao Ko Chang. 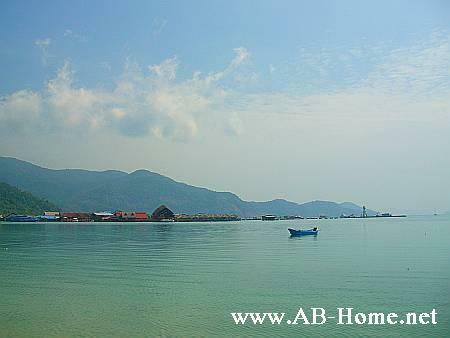 The simple bamboo huts on the beach are a popular travel accommodation and romantic destination for couples and backpacker. Remark Puzi Koh Chang is around 500 meter to the pier of Bang Bao which has touristic shops, restaurants and possibilities to enjoy the sunset behind the beach huts of Pu-Zi. On the desk of Remark Pu Zi Huts you can book scuba diving, kayak trips, jungle trekking and Thai massages for relaxing on a beautiful piece of land in Thailand. 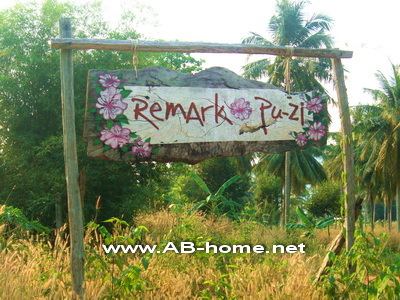 Bookings and Reservations for Remark Puzi and many other Koh Chang accommodations you can make here. 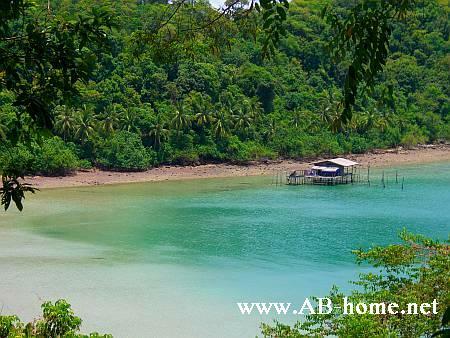 BB Divers is a 5 Star IDC center in Bang Bao on Koh Chang. 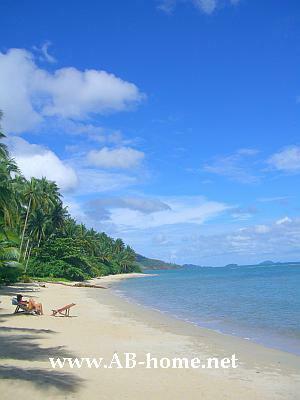 This Padi diving center offers fun dives, scuba diving courses and snorkeling trips around Ko Chang Island. 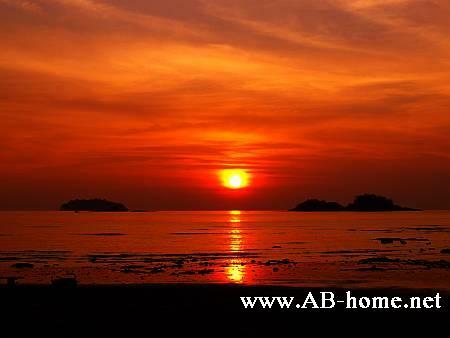 BB Divers Koh Chang has good and friendly staff and a good atmosphere on the boat. The Koh Chang Scuba Diving trips cost around 2600 (2009) Thai Baht for two scuba dives inclusive equipment, pick up from your hotel or resort, lunch and diving instructor for scuba courses or divemaster for fun dives. BB Divers in Thailand offers all Padi diving courses from open water diver over Rescue Diver to the idc diving instructor course. Divemaster internships and courses are as well possible. 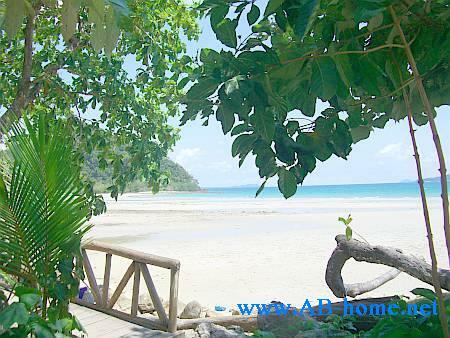 The Koh Chang diving center is located in Bang Bao but nearly on every beach are booking offices from BB divers. 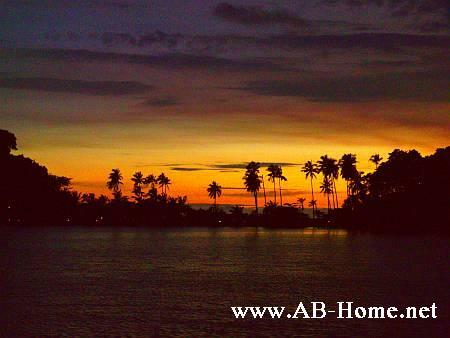 On lonely beach are the pool and a restaurant of BB Divers Ko Chang which is a nice diver meeting point and Koh Chang Nightlife location for relaxed evenings with self minded people from around the world. 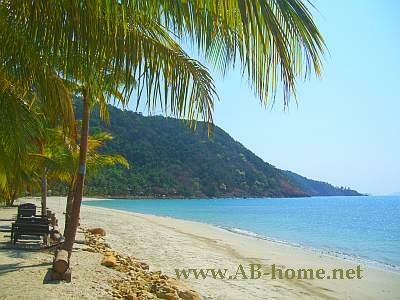 The best time for diving on Chang Island in Thailand is between November and February. BB divers Bang Bao open all day for fun diving and all Padi courses on Koh Chang in Thailand. For more information about prices, scuba diving and diving courses on Koh Chang ask at the BB Divers shop in Bang Bao or in any booking office on the other beaches. 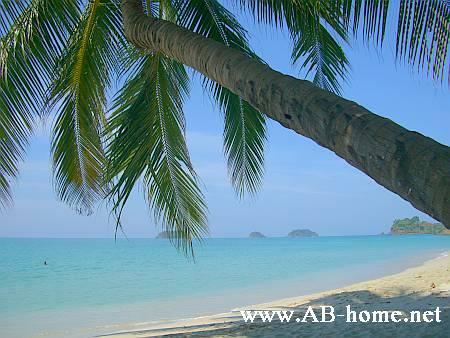 BB Diving Koh Chang have booking offices in White Sand Beach, Chai Chet and Lonely Beach. Bang Bao was a small Fisherman village in the south of Koh Chang. 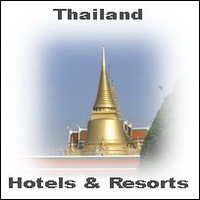 In the last years it changed to a “walking street” for tourists with souvenir shops, restaurants, accommodations and guesthouses. But still Bang Bao have flair. The Pier is around 1.5meter wide and 500 meter long. In the end of the pier there is a lighthouse from where you have a nice view over Bang Bao Bay. 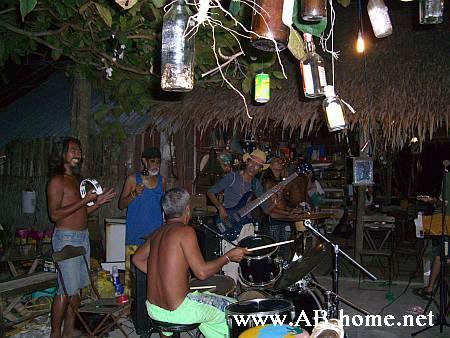 Bang Bao Sea Hut is the last bungalows on the right side of the longest pier on Koh Chang. 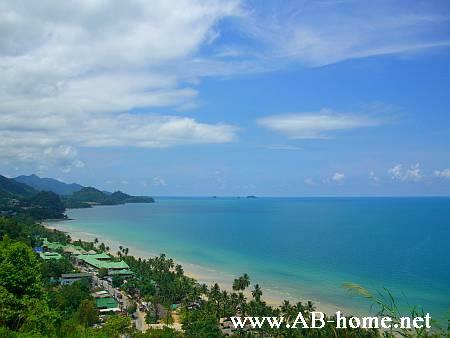 The Bungalows are direct over the gulf of Thailand. In nighttime you hear the sea under your bed. Moun and me check in here sometimes when we have a day off. 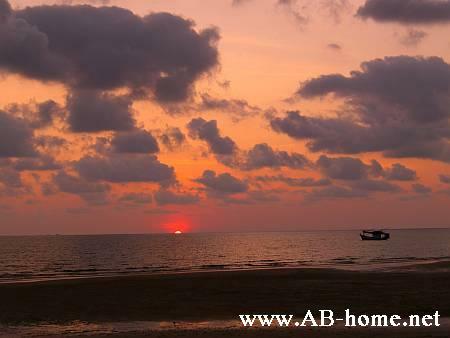 The nice eight corner bungalows have a balcony and a huge glass door where you can watch the beautiful sunset at Bang Bao Bay. For dinner we go mostly to the Sea Bird Restaurant Koh Chang. 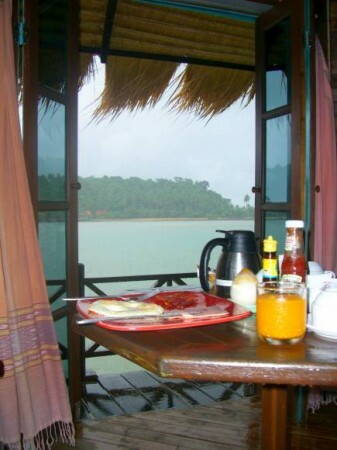 At Bang Bao Sea huts on Ko Chang they serve the American Breakfast to your balcony over the gulf of Thailand or inside your accommodation on the water by wide open door. It´s beautiful because of the snorkeling, scuba diving and fisher boats. 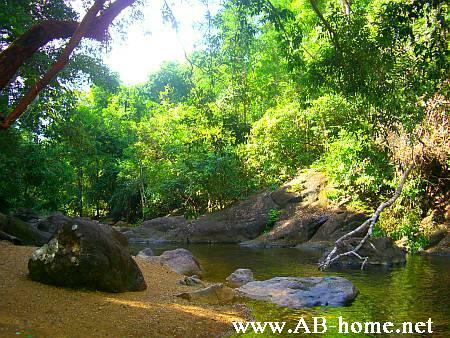 Many tour bocking offices offer day trips and boat tours in the Mu Ko Chang National Park. 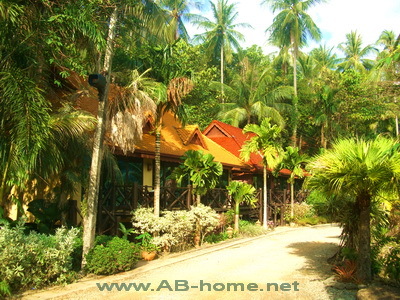 For this beautiful Bungalow I paid 1900 Baht in Oktober 2008. This price was for the room with minibar, kingsice bad, satelit TV, air-condition and hot shower with a nice stoh roof. The American Breakfast witch you get served on your balcony is aswell inclusive. 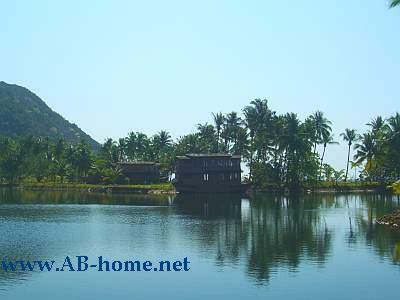 I like Bang Bao Sea Huts because of the nice atmosphere and the beautiful view to the sea. 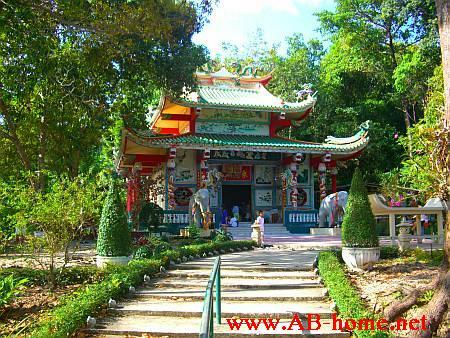 For more information about Bang Bao on Ko Chang look inside your Thailand Lonely Planet travel book.